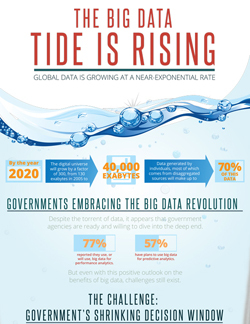 The big data tide is rising — and global data is growing at a near-exponential rate. Did you know that by the year 2020, the digital universe will grow by a factor of 300, from 130 exabytes in 2005 to 40,000 exabytes? Despite this torrent, government agencies are ready and willing to dive into the deep end: 77% reported they already use, or will use big data for performance analytics. But there are challenges in big data. And one of the biggest challenges? Government’s shrinking decision window. View our new infographic to learn more about this decision window and what you can do to prepare.